On the last day of summer vacation I took the boys to eat ice-cream. We sat around the table and were devouring our cones. I tried to take a picture for Instagram and I couldn’t get a good frame. All of a sudden an English-speaking woman came up to us, and so kindly offered to take a pic of all of us together. I was excited because I hardly have any pics with the kids as I’m always on the “wrong” side of the camera. I told her “thanks so much, this will be a great picture of the end of summer, and thank-god its over”. She looked at me and said, “interesting that all Israeli mothers respond the same way when talking about summer with their kids”. I didn’t know how to answer her. I felt all of a sudden guilt for having mentioned that I was happy that my kids were going back to school. I questioned whether Israeli mothers were just less enthusiastic about spending two months with their kids in the most intense heat than other mother around the world. Are Israeli mothers more complainers than our counterparts in say, Sweden or Canada? Does it have to do with the 100 degree weather and 90% humidity. I think it may. We had some amazing times together, me and the kids. We had an incredible vacation in Greece with my whole family. There were days that I felt completely in synch as a family and I was so happy with the quality time we were spending together. But there were other days that there were times I felt like having a mini break-down, and running away to Scandinavia. But thats it. Another summer is done. The kids are back in school, my middle one even started first grade, my oldest 3rd grade and my youngest started pre-pre K. It was exciting and also even a bit sad sending them off to their new learning environments. Their favorite recipe that I make for them for school is my bolognese. 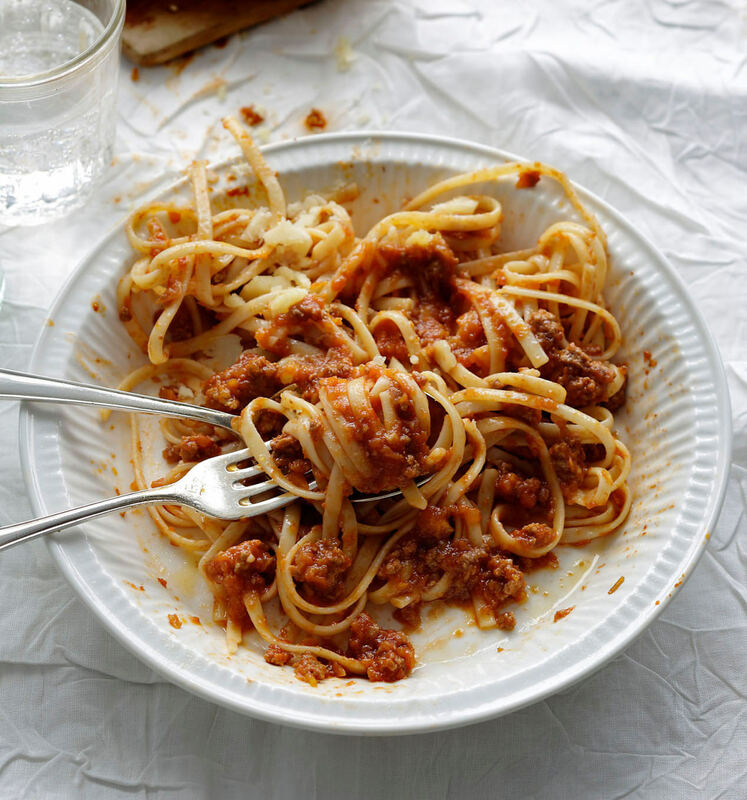 I call it consensus bolognese because there is not one kid, even the pickiest eater who wont eat it. The tastiness of this recipes relies on using fresh and quality ingredients, like fresh (not frozen) ground beef and a quality chopped tomatoes. Don’t skip out on the celery and carrots either, they give this dish its flavor. I like to serve this sauce with spaghetti but feel free to serve it with any pasta of your (or your kids) choice. Just make sure to cook the pasta with the sauce for a few minutes before serving. Place all of the vegetables, the carrot, onion, celery and garlic in a food processor and pulse until the vegetables are finely chopped, but not to a paste. Heat the olive oil in a large pan and add the chopped vegetables. Saute for about five minutes, until the vegetables become slightly translucent. Add the ground beef and sauté on high heat until the meat is browned. Add the tomato paste and mix. Add the chopped tomatoes, bay leaves, salt and pepper and mix. Lower heat and cook for at least an hour, preferably 2-3 hours (if you have the time). Cook one pound of your choice of pasta to al dente. 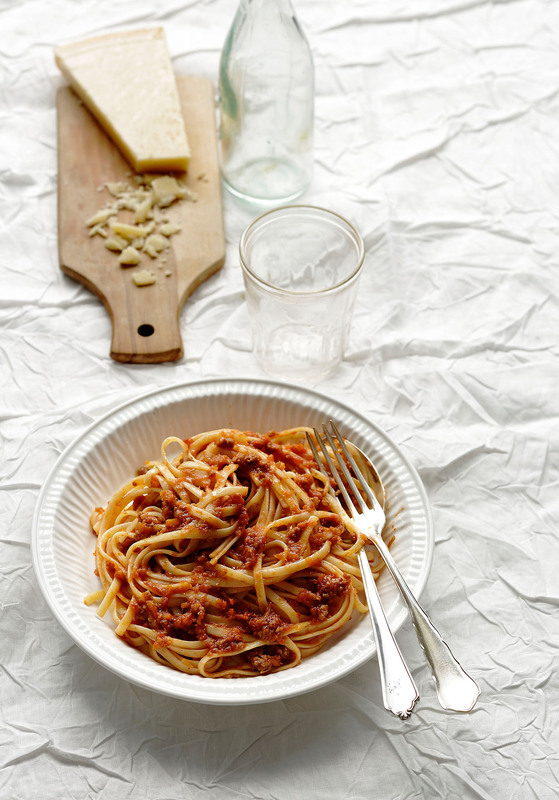 Remove a half a cup of the water from the cooked pasta and add it to the bolognese sauce. Mix the sauce and pasta together and cook on low heat for five minutes. Serve warm with fresh grated parm.